One of the most outstanding heathland golf courses in Wales is Bull Bay Golf Club on the Isle of Anglesey on Wales' north coast. The club was established in 1913 and was designed by Herbert Fowler, his only golf course in Wales. It sits high above the sea and overlooks blue water at most vantage points, while the course rolls through hilly, gorse-laden terrain. There are plenty of blind shots and elevated greens, making for a test stern enough to host the Wales' Young Professionals Ryder Cup in 2008. The 18th hole is a practically perfect finisher for a big event: a long par 4 playing straight downhill with the clubhouse and sea as a backdrop. Its fairway is a little more inviting than average as well, so you can really let it rip from the tee. The first hole at Bull Bay Golf Club plays straight uphill. Located on the Isle of Anglesey, Bull Bay has views of the sea from most vantage points. The second shot plays over a hill to the green on the long, par-4 second hole at Bull Bay. Tankers and massive cargo ships often pass by the golf course at Bull Bay. The most difficult hole at Bull Bay, the par-4 seventh features an approach that must play over a stone building on the left. The par-5 eighth hole plays uphill to an elevated green at Bull Bay. 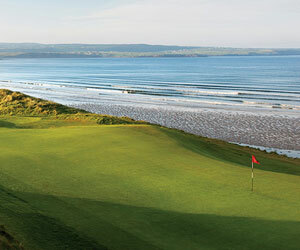 The par-3 16th hole at Bull Bay plays straight out to sea. A fantastic finishing hole, the par-4 18th hole plays straight and downhill at Bull Bay Golf Club with the sea as a backdrop. Considering off-season golf in the UK?